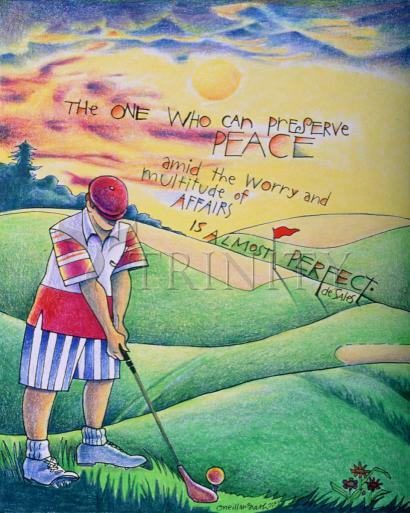 The one who can preserve peace amid the worry and multitude of affairs is almost perfect. In 1592, Sales received his doctorate in law and theology. He made a pilgrimage to Loreto, Italy, famous for its Basilica della Santa Casa (Shrine of the Holy House) and then returned home to Savoy. The Senate of Chambéry admitted him as a lawyer. Meanwhile, his father secured various positions for Francis, including an appointment as senator. His father also chose a wealthy noble heiress as his bride. But Francis refused to marry, preferring to stay focused on his chosen path. His father initially refused to accept that Francis had chosen the priesthood rather than fulfill his expectations with a political-military career. Claude de Granier, then Bishop of Geneva, intervened and after signing over to his younger brother his rights of family succession, he was ordained in 1593. Immediately he received a promised appointment as provost of the cathedral chapter of Geneva. In his capacity as provost, Francis de Sales, engaged in enthusiastic campaigns of evangelism in an area that had become almost completely Calvinist. According to J. Ehni, despite de Sales' zeal, courage and patience he met with absolute failure at Thonon, the capital of the Chablais province, where the residents had made an agreement to refuse to hear the eloquent preacher. At first Francis lived in a fortress garrisoned by the Duke of Savoy's soldiers. Several times he escaped death at the hands of assassins. He traveled to Rome and Paris, where he forged alliances with Pope Clement VIII and the King Henry IV of France. In 1599 he was appointed coadjutor bishop of Geneva. In 1601, he was sent on a diplomatic mission to Henry IV of France, where he was invited to give Lenten sermons at the Chapel Royal. The morals at court reflected those of the king which were notoriously bad, yet Henry became personally attached to Francis, and is said to have observed, " "A rare bird, this Monsieur de Geneve, he is devout and also learned; and not only devout and learned but at the same time a gentleman. A very rare combination." While in Paris he also met Cardinal Berulle and was for a time Madame Acarie's confessor. They consulted with him on matters such as the introduction of St. Teresa's Carmelites into France and plans for the reforming of monasteries and convents. He was consulted on matters of conscience by persons at court. In 1602, Bishop Granier died, and Sales was consecrated Bishop of Geneva, but resided in Annecy (now part of modern-day France) because Geneva remained under Calvinist control and therefore closed to him. His diocese became famous throughout Europe for its efficient organization, zealous clergy and well-instructed laity, monumental achievements in those days. He worked closely with the Order of Friars Minor Capuchin, very active in preaching the Catholic faith in his diocese. They appreciated his cooperation so much that in 1617 they made him an official associate of the Order, the highest honor possible to a person outside it. It is said that at Evian, on the south shore of Lake Geneva, St. Francis of Assisi appeared to him and said: "You desire martyrdom, just as I once longed for it. But, like me, you will not obtain it. You will have to become an instrument of your own martyrdom." During his years as bishop, Sales acquired a reputation as a spellbinding preacher and something of an ascetic. His motto was, "He who preaches with love, preaches effectively." His goodness, patience and mildness became proverbial.